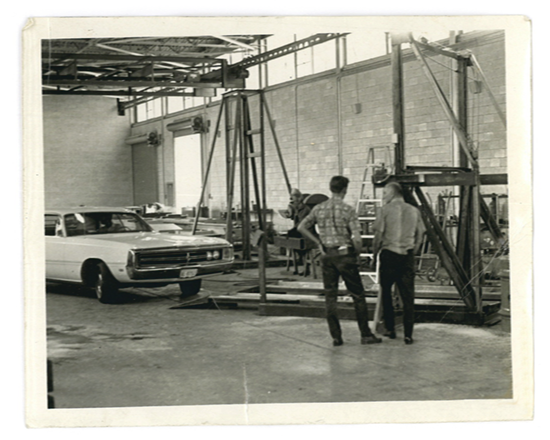 Harding has been continuously in the mechanical parking machine business since 1968. Harding Steel's Denver-based entrepreneurial roots date back to 1948, with Wayne Harding. Mr. Harding founded Harding Glass Industries which began a commercial and residential glass and glazing provider throughout the mid-west. Harding's work with metals and glass led to a relationship between Wayne Harding and Robert Lichti, the inventor of Vert-A-Park, a "Ferris-wheel" automated parking system. Shortly thereafter Harding established a similar affiliation with Ed Greer, inventor of the DuoPark, and Herbst Brothers, designers of Park Master. With these business affiliations the Mechanical Parking Lift Industry in America was born. To this day, there are DuoPark lifts operating in parking lots, private homes and commercial buildings across the Untied States and around the world. Currently, Harding Steel offers 14 different models of above ground, subterranean, and semi-automated parking systems to real estate developers, auto dealers, property managers, home builders, and owners of private residences. Harding Steel has installed our commercial systems throughout the U.S. and Canada for some of the largest real estate developers and construction firms. Parking operators in major cities and airports use our lifts daily in their space-challenged commercial parking facilities, while our above ground and subterranean parking systems have been installed in many of the most distinctive luxury homes in America. Harding Steel exports from our production facilities in North America and Asia to our customers in Canada, Latin America, Europe, and the Middle East. Harding Steel values its relationships with clients, employees, suppliers, and partners. Our corporate values are rooted in providing quality products, competitive prices, responsive customer service, and total integrity in all that we do. We are totally committed to maintaining high-performance standards on behalf of our clients, employees, suppliers, and business partners.